"The flag of the Ministry of Internal Affairs of Ukraine approved by the Decree of the President of Ukraine from December 19, 2000 N 1346/2000. It represents a cyan square panel by the size 130X130 cm. There is emblem on face side of a flag. In all corners of a panel the maps are gold garlands from oak and laurel leafage, in center which one are argent letters "MVD". The author is O.V.Rudenko. The back side of the flag contains an argent octagonal radiative aster with round crimson round in center. On its background is placard by white characters "The Ministry of Internal Affairs of Ukraine". Symbol is framed by a gold garland with the map of oak and laurel leafage. In all corners of a panel are the gold garlands from oak and laurel leafage, and in center of garlands is the St.Michael." The flags of Ministry of internal affairs of Ukraine (militia) and standard of the minister are at <www.geraldika.com.ua>. From <www.kmu.gov.ua>: On 10 August 1993 by Resolution of the Cabinet of Ministers of Ukraine No. 615 the State-Owned Guard and Protection Service under MIA of Ukraine was founded on the basis of guard subdivisions under the bodies of internal affairs. The State-Owned Guard and Protection Service is the centralized professional special-purpose system of subdivisions created with the purpose to implement guard and protection services. The State-Owned Guard and Protection Service acts on the grounds of self-finance at the cost received for organization and realization of measures under the treaties of private and property security of the citizens and legal entities. The following images are based on those. Interior Troops seems to be some kind of "special police force" as appear from their tasks at <guvv.centrmia.gov.ua>. Flag at the same page. The State-Owned Guard and Protection Service is the centralized professional special-purpose system of subdivisions created with the purpose to implement guard and protection services. The State-Owned Guard and Protection Service acts on the grounds of self-finance at the cost received for organization and realization of measures under the treaties of private and property security of the citizens and legal entities. See also: <do.gov.ua>. The flag is the logo on the middle of a crimson horizontal flag, as seen here. 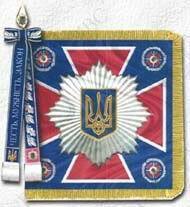 The image in the centre of this flag is the shoulder patch of the "BERKUT" (in ukr. - "golden eagle", Aquila chrysaetos) special ukrainian police force unit within the Ministry of Internal Affairs. "Berkut" had conflicts with Maidan protesters in Kiev in 2013-2014. In February 2014 new Ukrainian Interior Minister Ar. Avakov signed a decree on the dissolution of the "Berkut".